Purple Aces guard Kerri Gasper converted a 3-point play with 19.8 seconds to go. Then, following a Ramblers turnover, she cut her team’s deficit in half to 59-56 with a 3-point shot and two seconds left. But the Ramblers were able to squash the late rally, as forward Abby O’Connor iced the game with a pair of free throws before time expired. After the first quarter, the Loyola Ramblers squad looked out of sorts as a series of turnovers forced them into a 0-4 deficit. The Ramblers battled back and briefly held a 10-8 lead, but the Purple Aces finished the quarter on a 8-0 run. Purple Aces guard Brooke Bishop came off the bench and energized her team, finishing the quarter with 10 points. As the second quarter ensued, the Ramblers shook off the rust. Reserve sophomore forward Alexis Meyer immediately provided firepower, displaying great awareness in the paint and a soft touch from the inside. 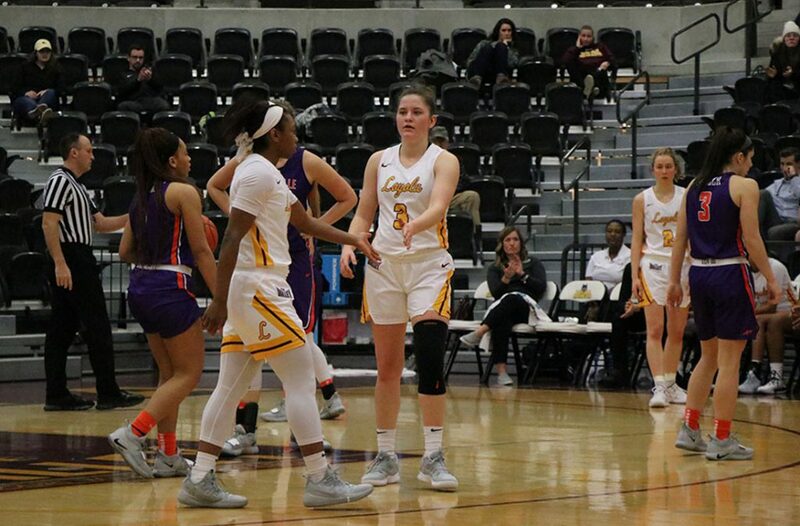 Meyer, who finished the game with 13 points on six of nine shooting, and junior transfer guard Jazmine Covington displayed great chemistry in rotation minutes, as they helped the Ramblers close out the quarter on a 10-0 run and a 27-20 lead heading into halftime. 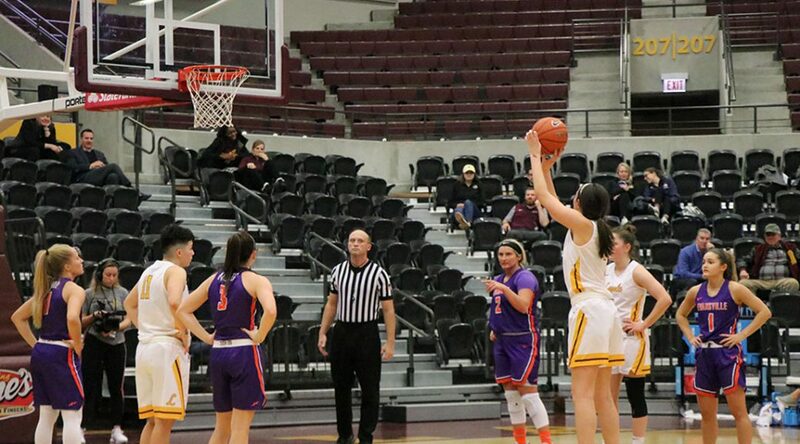 The break did nothing to cool off the Ramblers, as freshman guard Janae Gonzalez connected on a big 3-point shot to punctuate a quarter-opening 7-0 run that extended the home team’s lead to double digits early in the second half. However, the scrappy back court of the Purple Aces continued to keep the team in striking distance. Guard Makayla Wallace hit a pair of free throws that cut it to a 36-28 Rambler lead. Although the Ramblers ended the quarter ahead 48-38, the game felt closer than the scoreboard showed. Heading into the final period both teams cooled down, as a three by Loyola’s Maya Dunson provided the only scoring for the first four minutes of play. Loyola guard Tiara Wallace came on in the second half and finished the game as their leading scorer with 14 points, adding 9 rebounds and 4 assists. She provided a steady presence for the Ramblers, calmly finding her open teammates and locking down opposing guards on the other end. With the win, the Ramblers surpassed last season’s win total of 7, moving to a record of 8-7 with 14 games remaining. The Ramblers hope to carry the momentum of their win into Sunday as they suit up to take on another conference opponent: the third place Indiana State Sycamores.